Arthur Haralson passed away on February 20, 1997. Anne still lives in her home in Erickson and is still in good health. She enjoys going to her bridge club and doing crossword puzzles. The Harasemchuks were just one of the many fami­ lies who emigrated to Canada from the Ukraine at the tum of the last century, helping to build the community of Mountain Road in the R.M. 's of Rosedale and Clanwilliam. Alexious and Anna (nee Kostiw) Harasymchuk arrived in 1903 with their first boru son, Michael, aged 1 112 years. The other children, all boru at Mountain Road, included Maria, Anna, Jack, Metro, Martha and Peter, the youngest, boru in 1919. By 1924, there were more than 150 families in this thriving new community. Maria went on to marry Michael Yanchynski and lived in Cooks Creek (near Winnipeg). Anna married Simon Ostrowski and lived in Neepawa. Jack married Beatrice Prawdzik and, some time following her demise, he remar­ ried and lived in Brandon. Metro married, raised his family and continues to make ills home in Alberta. Martha married Tony Kuzyk and lived in Winnipeg. Michael, who never married, remained in Mountain Road, farming. when he retired at the age ot74. The Harasemchuk family therefore farmed for 90 years! Peter, at age 27, married Ethel Ferris of Riding Mountain in 1946. They had one son, Russell, and two daughters, Eunice and Donna. Peter farmed the original Harasymchuk homestead, legally described as 40 acres, section NE 13-17-17, his brother Michael's 40 acres (adja­ cent and part of the same section), as well as his and Ethel's quarter section in the Rosedale Municipality known legally as section SE 30-17 -16W sometimes with the help of his son, Russell, or his daughter, Donna. As well as farming, Peter (also known locally as Archie Harris) worked as a labourer at the golf course in Riding Mountain National Park, form 1960 to his retire­ ment in 1984. Since 1961, Peter has resided in Onanole with his long time partner, Lois Lilley. Peter's son, Russell, now lives in Airdrie, AB with his wife, Gisele. They enjoy two daughters, Chaylene and Cheri, and are proud grandparents of Larisa and Kaylie. Daughter, Eunice, resides in Winnipeg where she is close to her son, Darren, and daughters, Debbie and Diana. Eunice has two grandchildren, Gena and Shannon. Daughter, Donna, is married and makes her home in Vancouver. She and her husband have two daughters, Mary and Caitlin. Peter celebrated his 80th birthday on November 7, 1999 in Minnedosa with Lois, his son and daughter-in-law, his two daughters and several of the grandchildren. Harold was boru in Spalding, Lincolnshire, England. 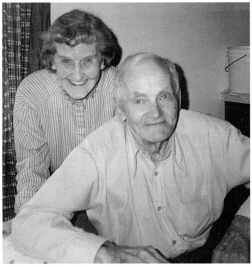 He came to Canada in 1908, where he met and married Agnes Marie Holmstrom who was from Basswood, MB. They moved to the Municipality of Clanwilliam in 1932. Harold and Agnes had fourteen children. Roy, now deceased, married Robena Crowbar from Basswood. They had 2 children, Bonnie and Joyce. Edna married Martin Jacobsen and they had 2 sons, Kenneth and Wayne. Edna now resides in a care home in Coquitlam, Be. Ellen married Larry Spurr and they lived in Maple Ridge, Be. They had no children and are both deceased. Arthur married Jeanne Elaine and they live in Port Coquitlam, Be. They had 5 children: Garth, deceased; Myrua; Glen; Brad and Dennis. Arthur passed away in Brandon, MB in 1989. Lorraine married Jack Rutledge. They had a son, Rod. Lorraine lived in Port Coquitlam, Be.